With the steady growth in Gemfields’ Mozambique Rubies production and with prices rocketing over the last few years, now is the best time and a wholesale supplier with its cutting factories in Thailand is obviously your best choice in a supplier. Popularity in the King of Colored Gems has also grown steadily over the last few years though we have always done well with Ruby sales and now do very well. Gemfields’ Montepuez Mine in Mozambique is not by far the only producer of Mozambique Rubies but has contributed to the large amounts of very good quality Mozambique Ruby Rough and Mozambique Rubies from the Mozambique Mines contributes as much as 80% of global ruby output. 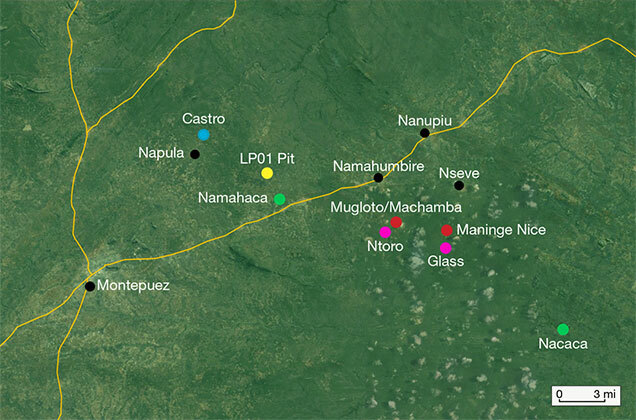 The main ruby mining areas of northern Mozambique. In the photo above, those labeled in red are worked by Gemfields, and in yellow by Mustang Resources. The green, pink, and blue areas are worked by garimpeiros; the green areas show where they are allowed to mine. The pink and blue represent sites inside MRM and Mozambican Ruby, respectively. 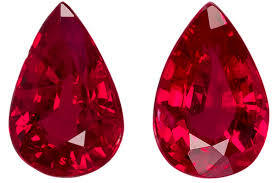 Its very interesting to know the difference between the mozambique ruby and logindo ruby from africa. Its also very interesting to understand the future of ruby which we will talk later, but ruby mining will continue to be enhanced in Africa as this continent brings new opportunity to mining companies, auction companies like Gemfields and Mustang. It is well known that with all of this unheated Mozambique Ruby Rough on the market, it is key to have a partner business in Thailand where the best experts at heating and cutting are located which includes our Bangkok wholesale gemstone manufacturing supply business and as mentioned in the GIA Fall 2017 article Update on Mozambique Ruby Mining and Trading. This rough is auctioned off unheated in Singapore by Gemfields for the high quality and India for the lower quality rough. It is estimated that Gemfields auction made more than $54 million in sales in a June 2017 Singapore Ruby Auction and Gemfields did it again in June 2018 when it announced that its auction in Singapore of rough rubies from its mine raised a company record of 71.8 million US dollars. 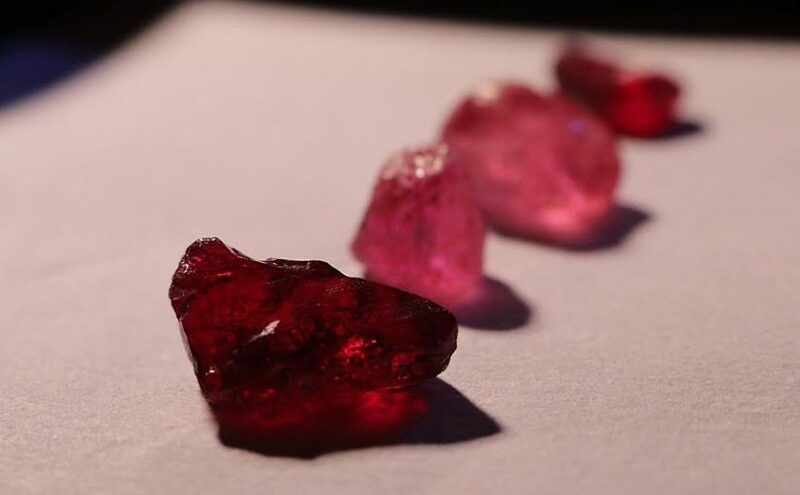 In an article from the Club of Mozambique, of the 86 parcels of rubies available at the auction, 82 were sold, fetching an average price of 122 dollars per carat. This was the tenth auction of rubies from Montepuez Ruby Mining Ltd (MRM) held since June 2014. In total, they have generated 407 million dollars. According to the company, “the consistency of supply and the reliability of the Gemfields’ grading system continues to be well received by buyers given that it reduces risk, improves manufacturing efficiencies and aids their ability to meet the demand for larger orders”. Growing demand in Mozambique Rubies and rising prices, may also be thanks to more Asian buying, which have spurred plans by Gemfields to increase production at the site over the next two years and build a new processing plant and a sort-house for grading the stones. This information is mentioned in an August 2018 article by BusinessLive.co.za. Also its mentioned that competition is growing which may increase production and therefore confidence in consumers too, resulting in increased demand. Our Wholesale Precious and Semi-Precious Gemstone Manufacturing and Supply Business located in Bangkok has been in business for more than 20 years here and has been selling Mozambique Rubies and many other Rubies from other sources around the world for the whole time. We can certainly attest to the increase in demand and in prices though we always do our best to keep your costs low but with the best quality in workmanship in both cut and in polish and in your rough material orders. Contact us today for your inquiries and orders and we will get your Ruby Red Mozambique Rubies ready to ship to you anywhere in the world.